With the 1946 World Series tied at one win apiece, the action moved to Fenway Park in Boston. If either team could sweep in Fenway, the Series would end. A split would send the teams back to Sportsman’s Park for at least one game. The question of using the “Williams Shift” was answered in St. Louis, but the question of how well Ted Williams and Stan Musial would do remained, as did the question of how well each pitching staff would hold up. The Bosox sent Boo Ferriss to the mound. With two out he walked Musial who immediately stole second. Then in a bazaar pick-off play, third baseman Pinky Higgins slipped in behind Musial and Ferriss caught “The Man” flatfooted for the final out of the inning. Cardinals starter Murry Dickson managed to get an out, then a single and ground out put Johnny Pesky on second with two outs. Dickson intentionally walked Williams to bring up Rudy York. York smashed a ball to left that cleared the “green monster” for a three run home run. It turned out to be all the help Ferriss needed. He gave up six hits, walked one, and struck out two on the way to a complete game shutout. Meanwhile the Red Sox tacked on another run in the eighth to win the game 4-0 and go up 2-1 in the Series. Game four was the only blowout in the Series. 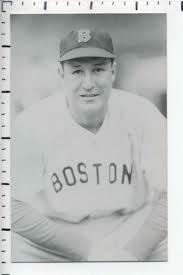 The Cards jumped on Red Sox starter Tex Hughson for six runs in three innings. An Enos Slaughter home run, a couple of singles, a sacrifice and St. Louis had three runs in the second. They added three more in the third on a single, an error, a double, and another single. Hughson didn’t get a single out in the third. The Cardinals proceeded to pile on five Boston relievers finally scoring a total of 12 runs. 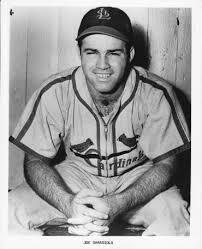 Catcher Joe Garagiola went four for five with two doubles and three RBIs. Shortstop Marty Marion was three for four with three RBIs. Boston managed all of three runs off St. Louis started Red Munger, only one of them earned. Two came on a home run by second baseman Bobby Doerr. Now with four games played, the Series was tied 2-2, making the championship a best two of three with St. Louis having two home games. Game five was played on a Friday, 11 October. It was one of the best games of the Series. The Sox got three hits and a run off St. Louis starter Howie Pollet. It was enough for manager Eddie Dyer and out went Pollet and in came reliever Al Brazle. 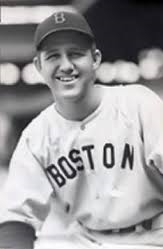 Boston starter Joe Dobson gave back an unearned run in the top of the second, but Boston went ahead in the bottom of the second on two singles sandwiched around a sacrifice bunt. The score stayed 2-1 until the bottom of the sixth when Leon Culberson launched a home run to put the Red Sox up 3-1. In the seventh a tiring Brazle gave up a double to Dom DiMaggio, then intentionally walked York. Higgins drove in DiMaggio then after another intentional walk, Roy Partee hit a double play ball to Marty Marion, who proceeded to throw it away allowing both York and Higgins to score. Then with two outs in the ninth, an error plated two final runs for the Cards giving Boston a 6-3 win. Dobson pitched well, striking out eight, walking only one, and allowing four hits. All three St. Louis runs were unearned. With the Series set to return to St. Louis with the Red Sox up 3-2 the question of how well the pitching staffs would hold up was pretty well answered. Other than the Boston meltdown in game four both staffs had done their job. The Cards had given up 14 runs, and Boston only 20 (12 of those in game four). So far neither Williams nor Musial were doing much. This entry was posted on August 25, 2014 at 7:48 am and is filed under Baseball. You can follow any responses to this entry through the RSS 2.0 feed. You can leave a response, or trackback from your own site. I wonder what my father’s reactions to this game was when he listened to it on the radio from the Bronx. I know that he had mixed feelings, between Marion of the Cards and Dominick of the Sox. I’m sure relatively sure that he was rooting for the Sox; he liked Dominick better than JOE, for crying out loud, and he was a YANKEE FAN! I talked to my father on the phone last night. He remembers that he rooted for the Red Sox. My intuitions were correct. He liked Marty Marion quite a bit, and Musial, too, but his favorite player was Dom DiMaggio, and he said he could never relate to shortstops, and Marion was a shortstop, because my father usually played the outfield, and, in fact, stood sideways in center field, facing left field, imitating Dom and his unusual outfield stance, his baseball idol. He used to play softball at Macombs Dam Park, which was literally in the shadow of the “old” Yankee Stadium, (the one that closed in 2008). I find the Yankees ownership and management greed nauseating as it is; they built the “new” (meaning current) Yankee Stadium right on top of where my father played softball and baseball as a boy, Macombs Dam Park. Most major league owners seem heartless, but the owners of the Yankees (led by the Steinbrenners, of course), I find PARTICULARLY nauseatingly greedy and heartless. I could NEVER root for that team. They put the new Yankee Stadium atop Macombs Dam Park, and it had kept city kids out of trouble and off the street. Do the Yankees care? How about the Parks Department? Nah. It’s all about money. Now, they FINALLY got a “new” Macombs Dam Park. It’s about time. If this kind of stuff doesn’t turn a person off to the New York Yankees, then nothing will.